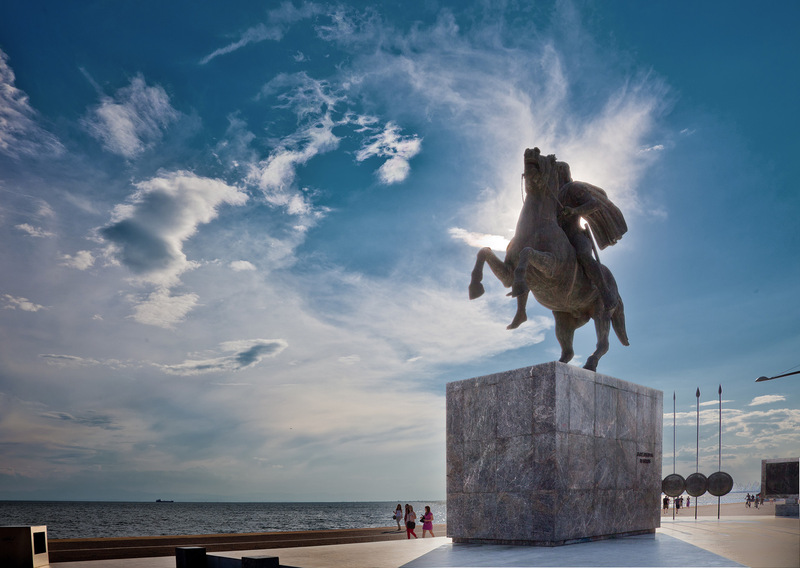 Thessaloniki, or Salonika, as most of the English-speaking world knows it, has one of the most beautiful topographical locations in Europe. The best thing about Salonika is that it is an organic, authentic, lively Greek city for the most part unsullied by rampant tourism. It is Greece’s best-kept secret. Situated on the Gulf of Thermi, on clear days you can see the impressive bulk of Mt. Olympus rise out of the mist fully 45 miles (60km) across the northern Aegean. By a trick of optics, the mountain, seen from the chute created by the buildings bordering long, rectangular Aristotle Square, which is the city’s focal point, looms large on the horizon. Coming downhill towards the sea from the Upper City, which has numerous timber and stucco buildings with picturesque projecting second stories known as “sahnisia ,” you cross the ruins of the Ancient Roman Agora. Just past the Agora, Aristotle Square stretches seaward. Continuing across Odos Egnatia, which was the ancient east-west axis connecting Constantinople with Rome during the Byzantine era, you walk down Aristotle Square towards the seafront, Olympus looming large on the horizon. Just before the sea, Aristotle Square opens into two colonnaded neoclassical buildings curving outward and seaward, like arms reaching out to embrace the Thermaic Gulf. The climate, protected from harsh winter weather by the Balkans’ Carpathian Mountains to the north, and favored with southerly winds coming up the Aegean from Crete and Africa, is unusually mild for its latitude, seeing only a few days of below freezing weather and a small dusting of snow in winter. 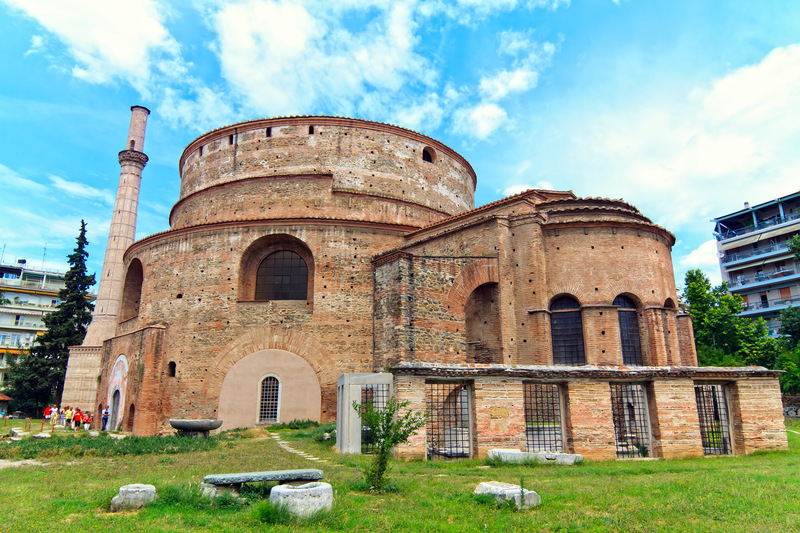 Thessaloniki’s history encompasses some 2,300 years. 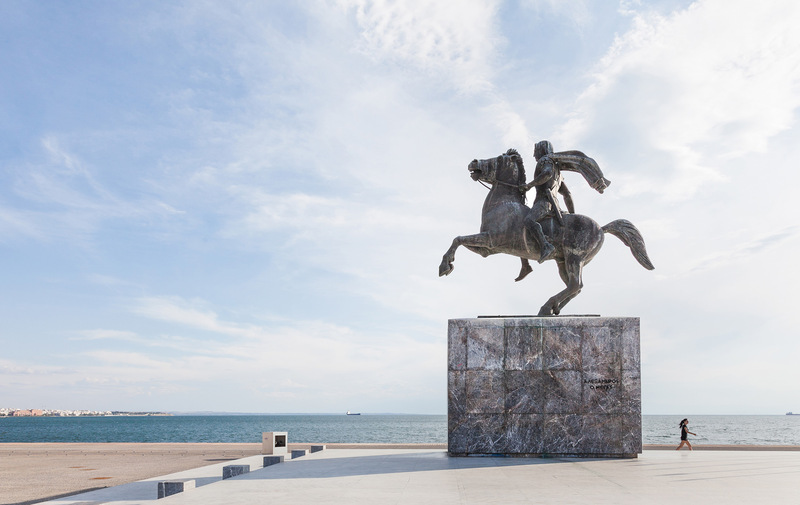 It was named for the half-sister of Alexander the Great, whose name derives from the victory (nike) of her (and Alexander's) father, Philip II, over the Thessalonians of central Greece. It was the second city, after Constantinople, in the thousand year-long existence of the Byzantine Empire. It is now the second city of Greece. Salonika was the home to thousands of Sephardic Jews, who were welcomed there after being expelled by the Spanish court of Ferdinand and Isabella in 1492. It was also home to thousands of Muslims, who were moved there after the Ottoman Turks conquered it in 1430. From that year until the Nazis exterminated 97% of the city’s Jewish population, Salonika had a demographic roughly one-third Muslim, one-third Christian, and one-third Jewish, which made for a local culture rich in diversity and high in tolerance. In a model for the modern world, the three faiths dwelt side-by-side within the massive defensive walls of the city in a sort of harmonic tension for over 400 years. The modern city has a metro area of about a million and a half. 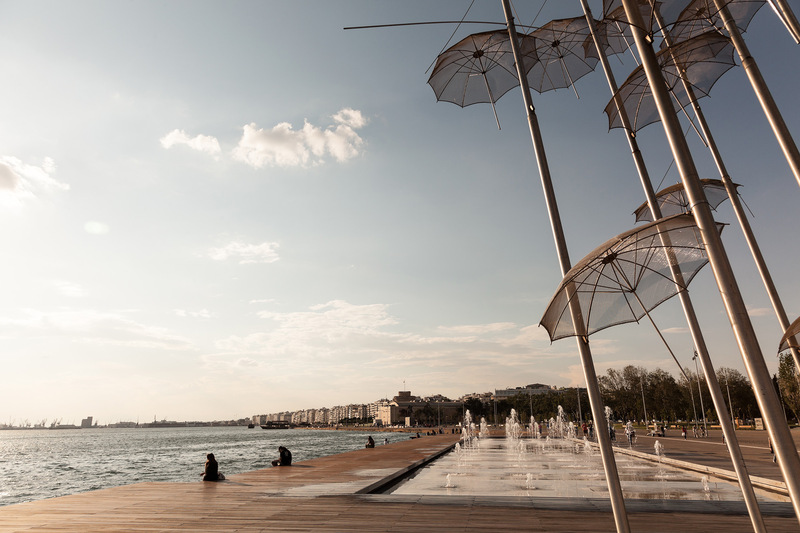 In an echo of its tripartite history, Salonika's appeal is largely to three classes of tourists: 1. Historians, who can visit the numerous monuments, artifacts, and museums from Salonika's Hellenistic, Roman, Byzantine, and Ottoman past. 2. Youth, who can enjoy the surprisingly lively cafe, arts, and nightlife scene of a place that Lonely Planet rated the "fifth best party city in the world." 3. Eastern Orthodox pilgrims, who can visit churches and holy sites as old as the church of Acheiropoietos, built in the fifth century. 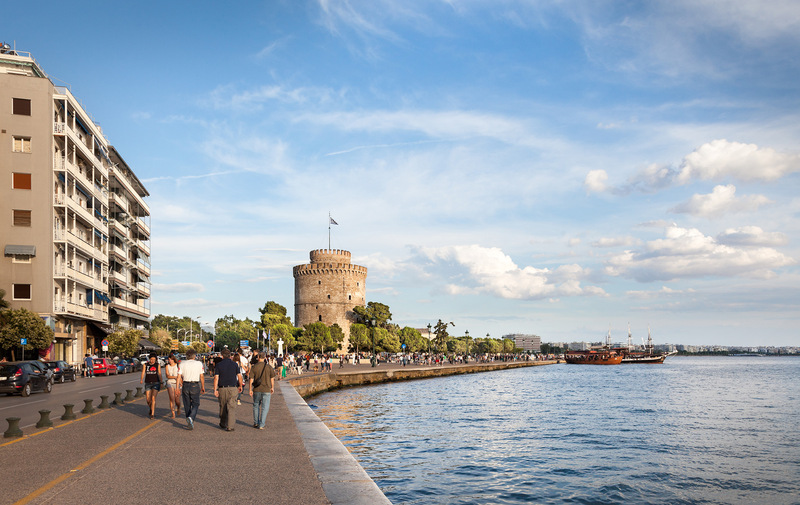 In a plus for pedestrians, these three features of Thessaloniki are mostly accessible by foot in the city center. Most places are no more than about kilometer from each other. Scattered about like precious stones on jeweler's velvet, there are at least fourteen major Byzantine-era architectural gems, including the 4th-century Rotunda, said to be the model for Royal Albert Hall in London, and the White Tower, a castellated, drum-shaped structure 34m high, which sits on the sweeping, boomerang-shaped harbor and is the city's emblem. There are the ruins of the ancient Roman Market. There are the massive city walls, spilling down from the picturesque houses and twisty, narrow streets of the Upper City. More recently in the city’s history, there is the house where Mustafa Kemal Ataturk, founder of modern Turkey, was born. The ancient churches, most of whose foundations are well below the present street level, include St. Demetrius, home of the remains of the patron saint of the city. Demetrius was a Roman soldier who converted to Christianity and was executed for his faith. He was said to be seen on the ramparts of the city when the Ottomans first invaded in the late 1300’s. There is Hagia Sofia, the church of Holy Wisdom, a 6th century structure in front of which boys play soccer in its sunken courtyard. And there is Acheiropoietos, home to an icon said to be sent directly from heaven and unmade by human hands. Because Salonika is home to over a hundred thousand students in various schools of higher education, chief among which is Aristotle University, Greece’s largest, there is a crackling energy in the air after the sun goes down. The city has an incredible number of cafes, many of them right on the seafront avenue, Leoforos Nikis. There are nightclubs and bars run by creative young people which feature first class popular bands. 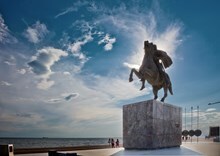 Salonika was voted “5th best party city in the world” by travel company Lonely Planet. There are numerous art galleries and various creative arts festivals, such as Salonika’s annual Film Festival which attract world class artists, sculptors, and filmmakers. There are also wealth of destinations in the region, including the ruins of Pella and Vergina about an hour to the west, where Alexander the Great and his father, Philip of Macedon, had their seat of power. Artifacts from these places, including Philip’s remains, which were authenticated in October, 2014, can be found in Thessalonikis Archeological Museum. Ninety minutes east of the city are the ruins of Ancient Philippi, where the first church in Europe was founded by the Apostle Paul. Paul later came to Salonika and left his mark there, founding the second European church, and writing two books of the New Testament addressed to the believers here. One of the fingers of the three-pronged Halkidiki Peninsula, about 66km southwest of the Thessaloniki, is Mt. Athos, the Holy Mountain, home to over two thousand Orthodox monks. Dedicated to the Virgin Mary, women are not allowed on the soil of Mt. Athos. The other two fingers of Halkidiki are tourist havens featuring crystal clear waters and the classic island-like lifestyle of modern Greece. Closer in to the city, across the Thermaic Gulf, are the beaches, bars, cafes, and restaurants of Peraia, Neoi Epivates, and Agia Triada, accessible by local busses or by a boat which leaves several times a day from Salonika's seafront and costs only 3 Euros. Passengers can see dolphins swimming in the gulf during the forty-five minute trip. As you can see, it would be impossible to exhaust the sights and sounds of this vibrant city in just a few days. It is a fascinating destination offering something for everyone. This underrated and undiscovered city becomes an instant favorite for whomever visits.